There are countless papers and articles on top risks for ERP implementation success. There are an equal number of articles about implementation methodologies to mitigate those risks. Requirements Based – This is the traditional approach to software development. Collect an extensive set of requirements that the system should be able to meet and then try to map those requirements to an ERP software package. Process Based – This is a modified requirements based approach. It advocates defining end-to-end processes that satisfy capabilities the organization is trying to deploy using an ERP. Solution Driven – This approach assumes the vendor’s software has best practices implemented and advocates applying them to satisfy capability requirements; any deviation from that is challenged. Methodology is defined in the Merriam dictionary as a body of methods, rules, and postulates employed by a discipline. Any Enterprise Resource Planning (ERP) implementation involves multiple disciplines. The extent of each discipline’s importance varies across the industry and across companies; e.g. the extent of organizational change required during the implementation of ERP varies across organizations. However, there are some paradigms that work best for delivering solutions quickly; they address the needs of the organization, and provide the foundation for users to deliver return-on investment. An ERP is the vendor’s culmination and implementation of an extensive number of companies’ and industries’ requirements. Those implemented requirements are packaged as a series of business capabilities and processes that must be integrated into the using company’s end-to-end processes. And lastly, ERP packages reflect the vendor’s interpretation of the most effective way to perform each business process. These best practices eases compliance with requirements such as Sarbanes-Oxley. They can also help compliance with de facto industry standards such as Electronic Fund Transfer (EFT). This is because the procedure can be easily codified and adapted across multiple businesses that share the same requirements. Additionally, the touch-points or interface to the company’s end-to-end processes must be documented and governance-approved so that they don’t create a burden with interfaces. It’s also vital to face the fact that no ERP will be a perfect fit for the business; there will be gaps that have to be accepted or filled with manual processes, bolt-on solutions, custom code, or SOA components. The gaps must be defined at the requirements level to properly understand the business impact of filling them or not. A solution driven approach is when the ERP team uses the actual software with the targeted users as an analysis and design tool. It is a very powerful approach, especially when you consider users don’t have the time and organizations don’t have the money to perform extensive process modeling or requirements definition. Additionally, when organizations invest in a process or requirements approach without referencing the ERP solution, more often than not they end-up with great and often expensive documentation of the as-is. While this has merits, the impact is often more interfaces and extensions than less. 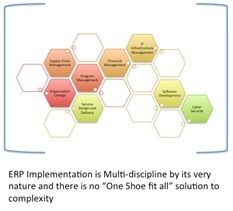 However, the solution driven approach will not support the first steps in the ERP journey: identifying the business problem; identifying ERP as the best solution; and selecting an ERP vendor that fits the company’s needs. After the problem definition, you need to do some High-level process modeling in order to identify the ERP that is the best fit and select the appropriate vendor. Process modeling includes scenario, capability, and architecture modeling. Process models should not extend beyond the business and organizational flows with supporting data objects (e.g., invoice, customer, order, receipt, service request) and supporting systems. Business scenarios are initial and high-level use cases. Remember, the ERP has all the basics covered. The scenarios should focus on the critical sub-processes or activities that make the company truly unique and are “make or break” for selecting using an ERP product (e.g., remote or mobile transactions, contracts, sales and inventory planning, pricing, invoicing, collections etc.). The capability modeling should identify the must and should have features needed to support the processes and scenarios (e.g., RFID compatibility, Compliance, Multi-language, Automated approvals, Contracts templates, Serialization, Part numbering, # of users, locations, etc.). The architecture model should identify the applications (purchasing, financial, inventory) that will be impacted or replaced by the solution and the enterprise solutions (e.g., security/identity, portal, messaging, ETL, Business Intelligence, encryption, etc.) that must be integrated with the ERP. If you find the modeling team is at the activity, swim-lane, database table, or protocol level; stop: you have gone too far. Additionally, the modeling will support investment prioritization, dependency identification, and team alignment for Agile development. Once you have picked the vendor and modules, the solution driven approach will help bind the remaining processes and architecture decomposition to the ERP capabilities. It will also provide users with something they can see and touch while they define the detailed data, business rule, and role requirements at a level that can be configured by a technician. Additionally, the team will be able to identify real process and capability gaps and their impacts to inform decisions about building Reports, Interfaces, Conversion, Extensions, Workflows, and Forms. These gaps are where you can apply the traditional requirements driven or Agile approach; the team is essentially embarking on a custom development effort within the ERP project. The identified gaps must be carefully evaluated and should be discouraged vigorously. There are many tasks that will be more efficient with an ERP application and there will be some tasks that will be less efficient. Keep in mind that any custom development in the ERP environment increases the possibility of a failed implementation. By some studies, 71% of total ERP failures are the result of extensive customizations and/or extensions under the guise of gap resolution. You must document the requirements well and make sure that they are must have to successful business processes vs. just matching the way your organization/business is accustomed to doing or likes to do things. An ERP is still the best alternative for replacing legacy applications and standardizing processes across the enterprise. It is important to apply a balanced approach and the right mix of methodology to be successful. Little has been written on ERP implementation projects from a project management point of view, and that’s why I would like to republish your post on PM Hut where many project managers will benefit from it.